Let us cease this charade: Lavie Tidhar’s Central Station must win the Arthur C Clarke Award of 2017. I say this without having yet completed the shortlist; but the notion that a work as important or lyrical or entertaining has been published in the last five benighted years of science fiction seems unlikely, much less that by chance two, like iridescent buses, have come along at once. Here is a linked series of short stories, ones published in many cases years apart and miles away, rethreaded with additions and dilations into not so much a whole as a tesselation. This is the anthology as mosaic, the collection as gauzed screen. In the gaps of these careful overlappings, you understand, is the work’s singularity. All of Tidhar’s writing in Central Station is as elegant as this. All, too, is as capacious: note that identities in his world are still exclusive, and yet also come to accomodation; note that space, not just earth, is now a place from which people may hail; and note, too, that inequalities and inequities still persist – just differently than we may in this moment now predict. Only science fiction can build such a world in which ideas may be tested; and, in also creating new identities to inhabit his storied Central Station, Tidhar demonstrates how. Miriam’s brother, Achimwene, is one of the few humans not able to access the “Conversation”, a sort of immanent Internet; he and his fellows – mostly men – feel “broken in some fundamental fashion” [p. 133], and are treated so by others. Boris Chong, Miriam’s erstwhile lover, is bonded with a Martian “Aug”, which has the habit of “feeding him alien thoughts, alien feelings” [p. 45]; he is also a descendent of Weiwei Zhong, an early settler at Central Station who persuaded an Oracle, a human joined in turn with one of the highly evolved AIs known as Others, to grant all his descendants a shared memory, allowing each to relive their times past. Boris once had an affair with a data-vampire known as Carmel, and some of the worst persecution in the book is doled out to her upon her arrival in town, since she is seen – in an echo, perhaps, of witch trials – as a threat to the “normal” community. There are many other distinct identities: the Robotniks, decommissioned cyborg soldiers; the possibly immortal Ibrahim, a rag-and-bone man and much more, or the god artist Eliezer; and members of the many faiths of Central Station, both familiar to us and less so, some of whom are ministered to by R. Brother Patch-It, a tragic figure and a robotic priest. It’s hard not to reach for superlative comparisons in all this, difficult not to suggest, however helpful or otherwise, that Tidhar matches the invention and wit of Le Guin or Harrison, Wolfe or Tiptree. To return to the motif of layers, Tidhar situates himself in this most august of company in the ways he places invention on top of borrowing, intimation across parallel, until he creates from whole cloth a world which also feels startlingly relevant. Again: you cannot achieve the effects Tidhar here achieves in ways other than the science fictional. Not being a novel, too, Central Station does not feel the pressure of resolution. The story sequence has an ending, but in truth it is no more final than any of the other many closures that take place throughout the work – and nor is the collection’s final scene very much more than a vignette, similar to many such moments in far earlier stories – Isobel, a ship’s captain in one of the Conversation’s most popular environments, the Guilds of Ashkelon, putting her head to the cold chest of her Robotnik lover, or Ruth Cohen, descendant of the evolutionary scientist who gave rise to the Others, accepting the irreparable fusion that will transform her into the Oracle. The final pages of Central Station don’t really tell us who or what Kranki is, or how and why Israel and Palestine are now names from a distant past. “You couldn’t answer everything,” the robo-priest ruminates at one point. “You could only believe there were answers at all” [p. 112]. Queasily, the protestors, like anti-abortion activists now, believe in Cohen’s creations’ right to life – it is they, not he, who ensure the Others’ survival when they storm his laboratory. But he enables their existence by accepting that things must be allowed to be what they are – or what they will be. Science fiction is often opposed to this que sera sera approach, since its protagonists tend to have the technological or epistemological power to change things. Central Station allows for these figures, but also repurposes religion – another traditional bête noir of science fiction (a difficult and increasingly problematic blind spot to have when interpreting our current age) – as a sort of next-step for these intelligent designers. When it emerges that Boris had a hand in the creation of whatever set of super-children Kranki represents, Miriam scolds him: “What’s human? […] They’re children, Boris. For all that you birthed them, for all the designer care and the fluids and getting your hands dirty, you never understood that” [p. 189]. In other words, we must accept the agency of others before we can live side-by-side. It’s worth saying that Central Station also exhibits all the gleeful perversity for which, perhaps because of its gross-out prominence in works like the Hitler-gumshoe fable A Man Lies Dreaming, Tidhar has already created a rather bigger name than he has won for his wisdom. Here we encounter a “Golda Meir automaton [which] journeyed to ancient Mars-That Never-Was, and changed from the course of a planet” [p. 53]; we hear a player who died in-game crow, “That was awesome! […] Flatlined! In a singularity! I won;’t have to buy drinks for months!” [p. 200]; and we learn that Ogko, to whom there is a shrine almost everywhere in the world of Central Station, “cheerfully admitted … [he] was a liar” [p. 72]. Tidhar has given up none of his humour; rather, he has worked it into a wider worldview. In a meditation on Central Station, the current Shadow Clarke jurist Jonathan McCalmont reflects on the novel’s almost urgent relevance: “To believe that multiculturalism can be overthrown or defeated by even a powerful political movement,” he argues, “is to ignore how subjectivities and identities are even formed.” McCalmont may be waxing uncharacteristically optimistic here. 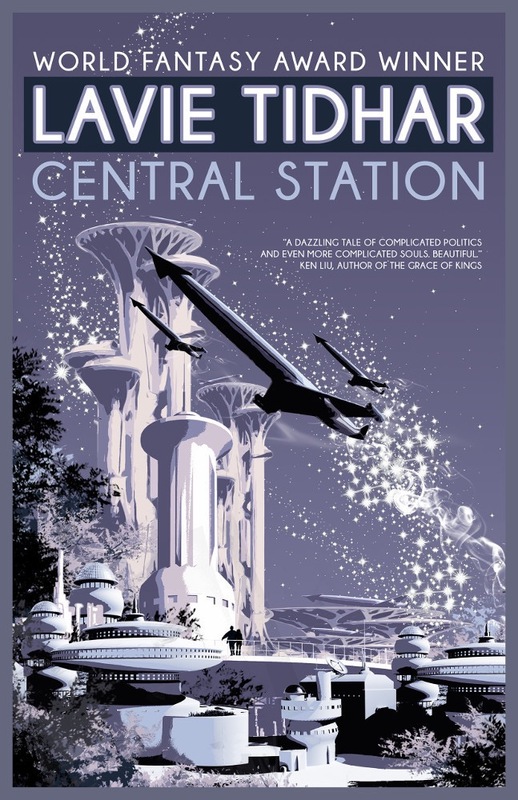 Regardless, what Central Station does beautifully, and does so because it is such a well-written piece of well-conceived science fiction, is to depict precisely how identities form, why they are important – and the ways in which we might imagine them as both inviolable and non-exclusive. Let us cease this charade.